I love coffee. I have loved it so long, and in such great gulps, that it’s become nourishment to me, necessary, an essential element of my nutrition. Without my morning mugfuls, my brain would send its electrochemical soup back to the kitchen and retreat, screaming, from the least sliver of daylight. I know drinking coffee is a choice. People live without it. I could. But I won’t. I like it. I love it. I actually enjoy it, savor it, shiver with pleasure at a perfect sip. 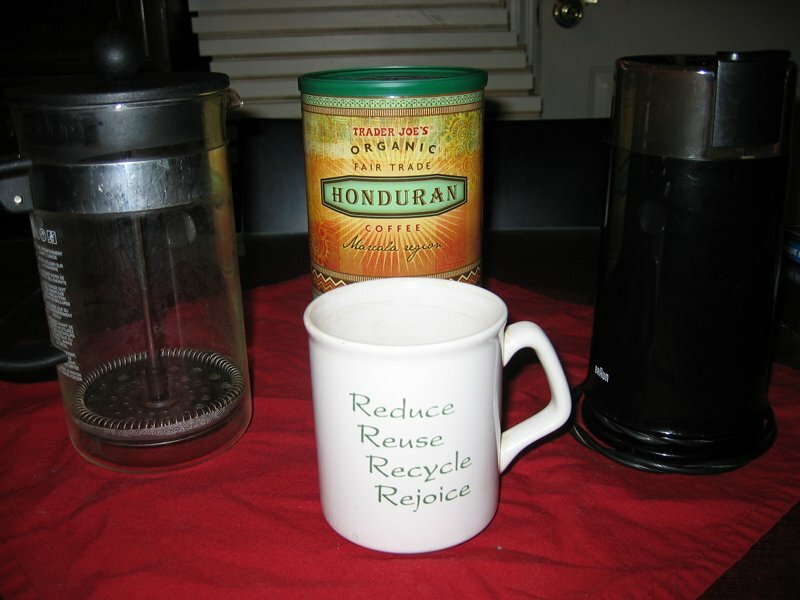 I’ve cut way back from the amounts I consumed in my building-trades and grad-school days, when Mr. Coffee would make a full 14-cup pot before breakfast for me and sometimes brew a half-batch for an evening pick-up. My concerns were pretty much solely with quantities then. Now I think about the sustainability of coffee production and the ethics of the agricultural and labor practices involved. I buy fair trade beans, but that only goes so far toward addressing the issues. So I drink less and try to enjoy it more. I grind the beans just before use. I steep them in a french press. It holds enough for the three cups I drink while I write my morning pages. That’s it; I don’t have any more the rest of the day, unless I meet someone at a coffee shop. If so, I exercise restraint. Lately I’ve been attending to my state, though, as I infuse it with the essence of the roasted seeds of Coffea arabica. About the time I finish the first cup, I feel my mind rouse and shake itself. When I drain the second and pour the third, all the lights behind my eyes have gone green. Two cups are enough. That final cup is just, well, a habit. So … what if … I shed it? God help me, I’m gonna try.